Ballynahinch Rugby Club invited Councillor Enright to set up a stand at the club last Saturday to collect signatures of the Downe 24-hour accident and emergency campaign. Club members also assisted in manning the table and announcements were made drawing spectators attention to the campaign. Club members expressed anger and frustration that Down sports clubs were being denied such an essential facility at weekends. Ballynahinch RFC is Down Districts premier Rugby Club and fields 7 Adult teams, 4 Youth teams and 220 Mini Rugby players every weekend. This is more than any other club in Ireland. Ballynahinch is also the only Ulster club to achieve representation in top division of the Ulster Bank All-Ireland league. Club member John Thompson agreed and pointed out that this affects all teams in all sports. He said that to his personal knowledge there had been 5 incidents at the Green High in the last year where A& E was required. Down High PE teacher and rugby coach Charlie Knox agreed and estimated that there were approximately 12 sporting incidents a year needing support of the A and E at the school. 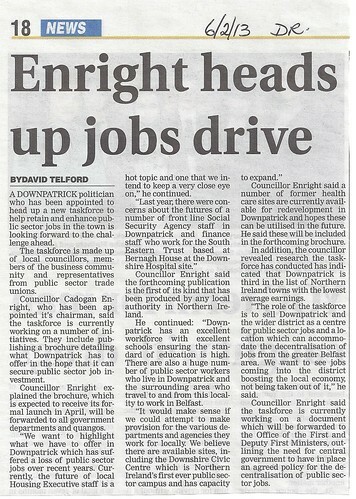 6th Feb 2013Enright heads up new Public Sector Jobs Task Force, a photo by CadoganEnright on Flickr. Councillor Cadogan Enright heads up new task force to protect jobs in the Public Sector being ‘decentralised’ to the Greater Belfast Area. Firstly can I welcome Divisional Roads Manager’s statement regarding plans to tackle traffic management in Downpatrick. I am also pleased that Roads Service will shortly be receiving a comprehensive study to identify and assess potential measures to improve traffic and pedestrian movements at a number of junctions in Downpatrick. We will be able to add this to the long line of similar traffic studies which have generated little response from Roads Service in terms of projects on the ground. The analysis of the congestion problem by Kevin Monaghan in Downpatrick is helpful however, even if it is again lacking in detail. 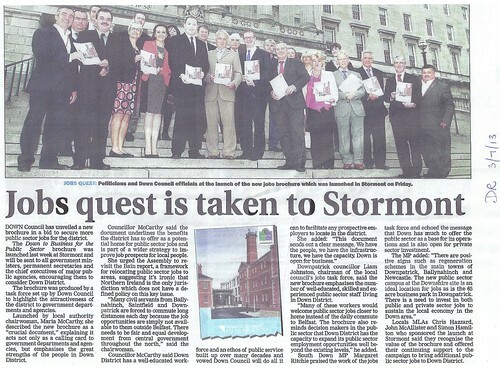 Mr Monaghan lists some of the schemes and some elements of progress. But two key issues remain for me as a public representative. Firstly, the unbalanced consultation into the one-way system at Edward Street continues to be of concern. Mr Monaghan’s assertion that this is how such consultations are conducted is at variance with best practice in the public service. He admits that the overriding factor for Roads Service was the displacement of 3,000 vehicles from the Edward St area. Why then did Roads Service inform Council that they would use the resurfacing of Edward Street as a test of a one-way system?, and why did they feel a consultation exercise of any sort needed to be undertaken? Secondly and more significantly, Council is still awaiting detailed responses to a series of questions put to Roads Service at a formal meeting over 7 months ago. At Council meeting on 22 October 2012 members posed a series of questions to Roads service officials regarding the inadequacy of Road Service’s response to congestion problems in Down District, and Downpatrick in particular. Questions were also raised about the inadequacy of the Capital Programme for the District. These questions are shown below. The public statement by Divisional Manager makes no reference either the outstanding questions, or to timetables for each scheme or the likely benefits in terms of traffic flows. 1. Can you confirm the capital programme for Downpatrick/District and provide background papers including indicative or detailed costs, Appraisal Summary Tables and supporting documents for all such schemes? 2. When will construction work start on the A24 Ballynahinch by-pass scheme? 3. What is the agreed timetable from Roads Service for each identified improvement scheme or initiative for Downpatrick, including those to alleviate traffic congestion? 4. 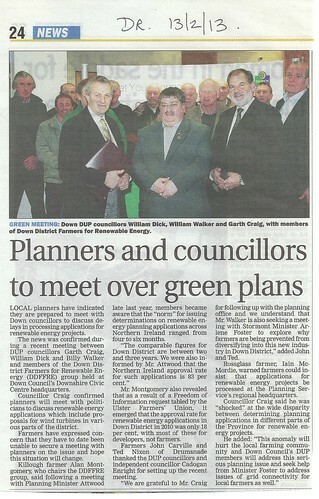 What improvement in traffic flows for Downpatrick will be generated by these schemes, singly and collectively? 5. Can Roads Service provide details of all roads schemes considered in last 5 years for Downpatrick in addition to agreed and programmed schemes? 6. How much additional funding does Downpatrick attract from DRD in recognition of its location on Regional Strategic Transport Network? Council has sought to pursue this information by a series of letters and FoI requests to local Roads service officials, TransportNi, the Permanent Secretary of DRD and the Minister himself. All responses have been lacking the required detail, despite Roads Service claims that they have supplied answers to what they were asked. Their repeated message is that Downpatrick is no more congested than other Northern Ireland towns. As a consequence Roads Service will continue to deploy inadequate capital investment in the District. Towns like Comber now have two by-passes whereas even the most basic junction upgrades promised years ago in Downpatrick are still not delivered. Based on their responses to FoI requests, it would appear that they have actually no detailed work done on these projects on most of their project files. It is clear Roads Service is intent on avoiding answering these questions fully. Council and local people have a right to know how far each identified scheme has progressed, what stages have been reached in realising each project and what further work is needed by Roads service to make these schemes ready to be implemented. Council, and I as a public representative, will continue on behalf of the ratepayers who fund the Roads Service, to press for answers and to make available all requested information. PS I attach a list of in projects in Downpatrick and Down District, featuring the information so far supplied by the Roads Service, in the format used by the Roads Service themselves – you will note that most information boxes are blank. 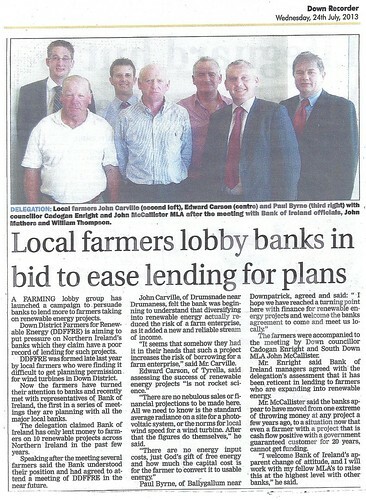 Lecale farmers concerned at refusal of planning manger to meet 5th Dec 2012, a photo by CadoganEnright on Flickr. 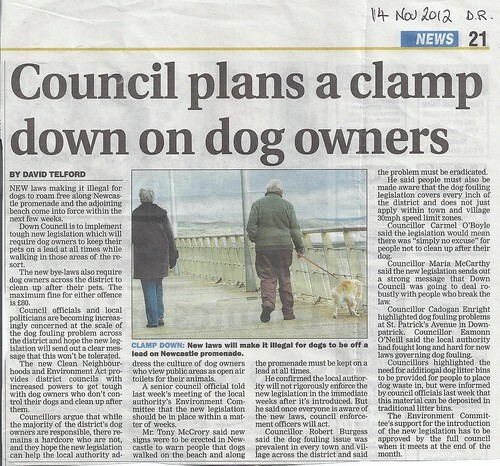 Dog Fouling bye-laws get tough 14th Nov 2012, a photo by CadoganEnright on Flickr. 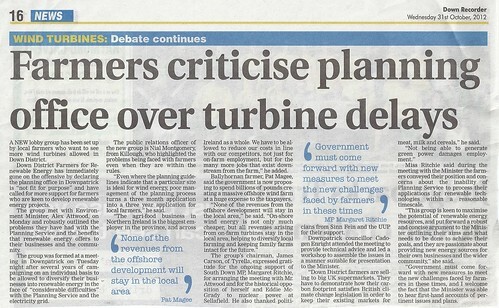 Farmers criticise planners over delays 31st Oct 20110001, a photo by CadoganEnright on Flickr.